Don~t take the season lightly! Mary janes in a synthetic upper. Hook-and-loop closure for easy on and off. Textile lining and footbed. Durable rubber outsole. Imported. Measurements: Weight: 6 oz Product measurements were taken using size 2 Little Kid, width M. Please note that measurements may vary by size. Weight of footwear is based on a single item, not a pair. Don~t take the season lightly! Mary janes in a synthetic upper. Hook-and-loop closure for easy on and off. Textile lining and footbed. Durable rubber outsole. Imported. Measurements: Weight: 4 oz Product measurements were taken using size 8 Toddler, width M. Please note that measurements may vary by size. Weight of footwear is based on a single item, not a pair. Great looks come easy with the Waylon EZ sneaker. 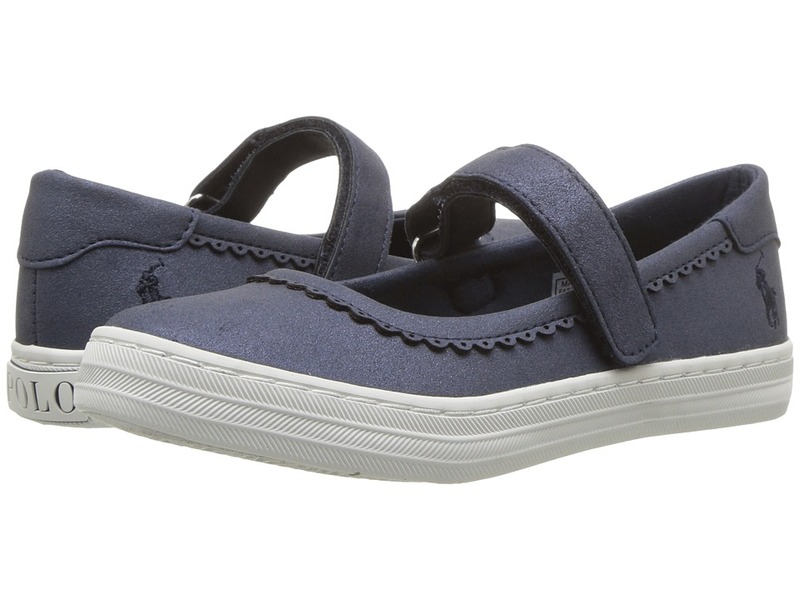 Durable canvas upper with contrast piping. Embroidered signature Pony logo on side. Dual hook-and-loop straps for adjustability. Smooth textile lining. Padded footbed. Rubber sole. Measurements: Weight: 5 oz Product measurements were taken using size 8.5 Toddler, width M. Please note that measurements may vary by size. Weight of footwear is based on a single item, not a pair. 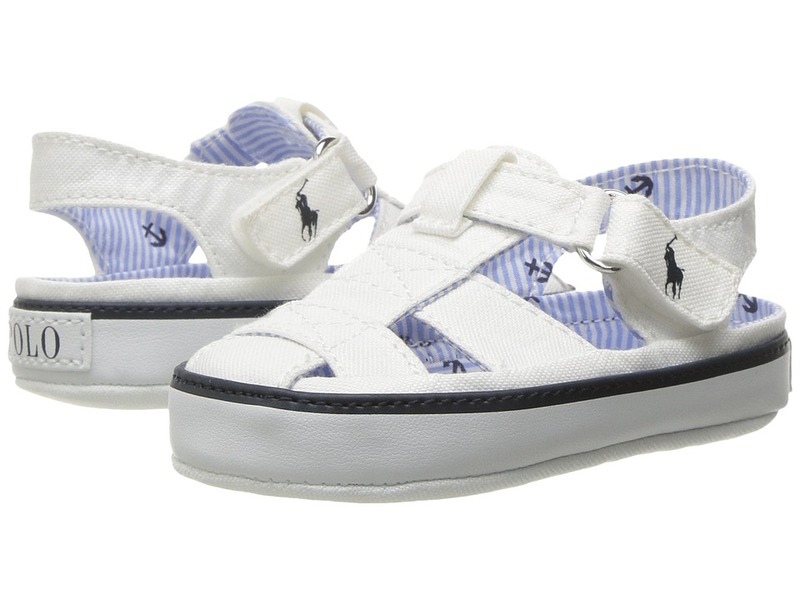 Every single step should be laid back in the Lia sandal from Polo Ralph Lauren Kids! Sandals in a manmade upper. Fabric straps for pops of color or pattern. Three-point strap for easy slip on and off. Textile lining for great next to foot feel. Light padded footbed. Durable synthetic outsole. Imported. Measurements: Weight: 4 oz Product measurements were taken using size 2 Little Kid, width M. Please note that measurements may vary by size. Weight of footwear is based on a single item, not a pair. 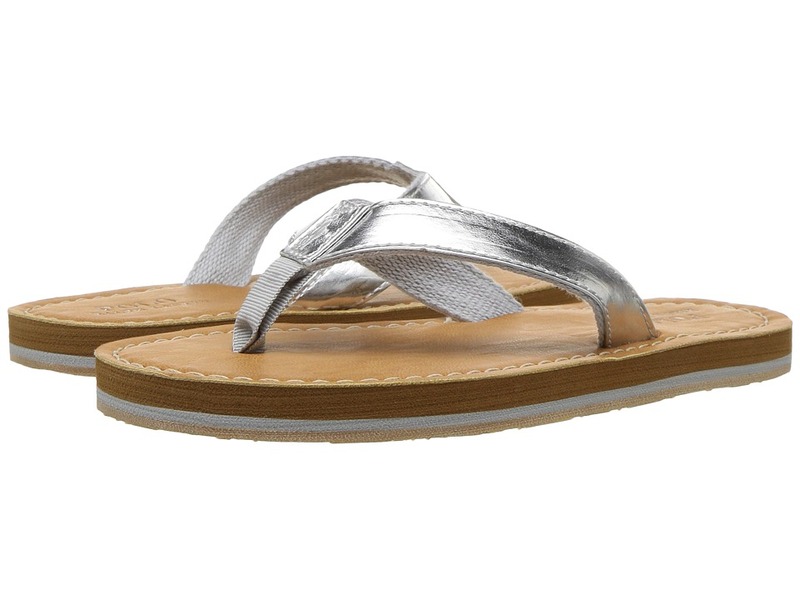 Every single step should be laid back in the Lia sandal from Polo Ralph Lauren Kids! Sandals in a manmade upper. Fabric straps for pops of color or pattern. Three-point strap for easy slip on and off. Textile lining for great next to foot feel. Light padded footbed. Durable synthetic outsole. Imported. Measurements: Weight: 5 oz Product measurements were taken using size 7 Big Kid, width M. Please note that measurements may vary by size. Weight of footwear is based on a single item, not a pair. Smooth out his style with these suave loafers. Leather upper. Moc toe. Penny keep strap. Leather lining. Lightly padded insole. Flexible rubber outsole. Imported. Measurements: Weight: 8 oz Product measurements were taken using size 5 Big Kid, width M. Please note that measurements may vary by size. Weight of footwear is based on a single item, not a pair. The versatile Allie ballet flat is great for everyday or a subtle dress up. Fabric upper features an allover print. 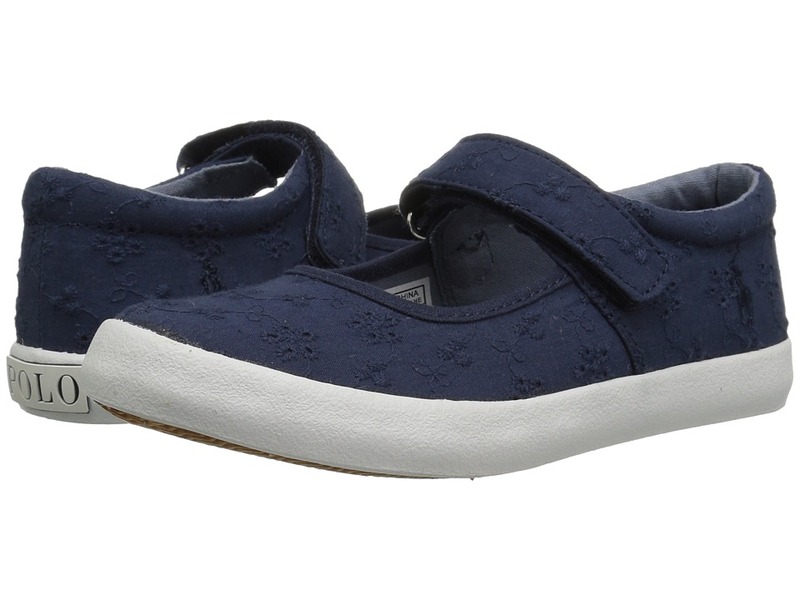 Easy slip-on with an elastic mary jane strap. Pre-tied bow. Soft textile linings. Cushioned footbed. Embroidered logo on the side. Matching covered outsole. Imported. Measurements: Weight: 1 oz Product measurements were taken using size 3 Infant, width M. Please note that measurements may vary by size. Weight of footwear is based on a single item, not a pair. 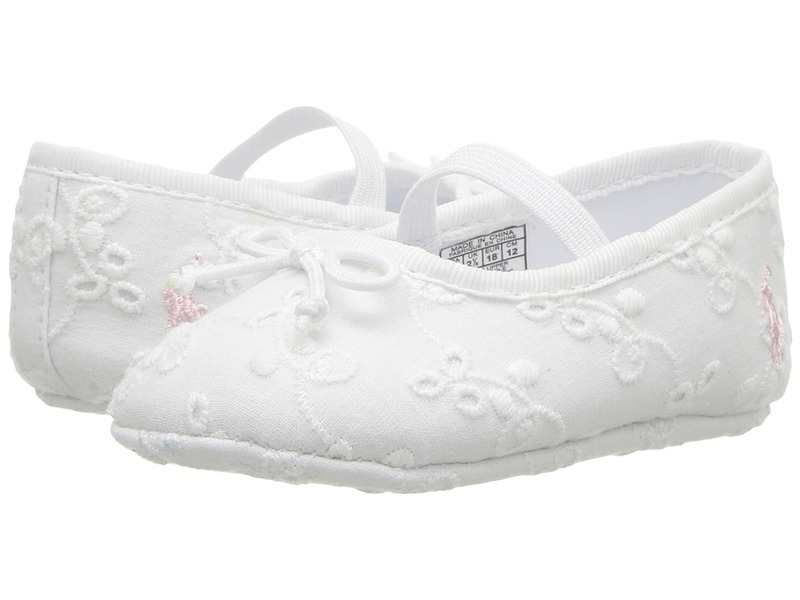 They~ll love relaxing in Cozy style with this sweet slipper from Polo Ralph Lauren Kids. Alphabet-print cotton canvas upper. Hook-and-loop closure for easy on and off. Grosgrain ribbon trim. Signature embroidered pony at the outer side. Textile lining. Lightly padded insole. Durable synthetic outsole. Includes a signature Ralph Lauren&amp#8722embossed box. Imported. Measurements: Weight: 1 oz Product measurements were taken using size 3 Infant, width M. Please note that measurements may vary by size. Weight of footwear is based on a single item, not a pair. Easy style in the Dyland EZ! Cotton canvas upper features signature Pony logo at tongue. Dual hook-and-loop closure for easy on and off. Lightly padded insole. Textile lining. Durable synthetic outsole. Imported. Measurements: Weight: 1 oz Product measurements were taken using size 3 Infant, width M. Please note that measurements may vary by size. Weight of footwear is based on a single item, not a pair. 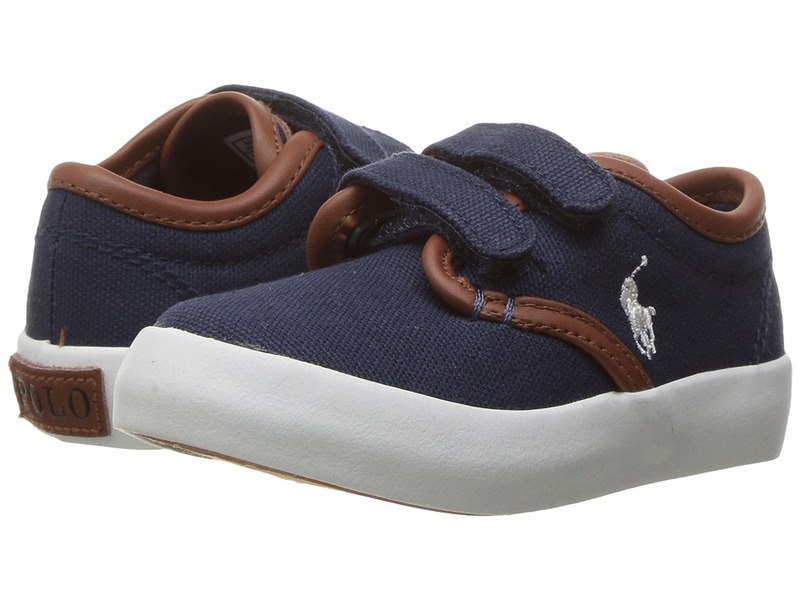 Welcome a new little one into the world with the charming Percie crib shoe from Polo Ralph Lauren Kids. Cotton-blend upper features an embroidered Polo Bear at the vamp. 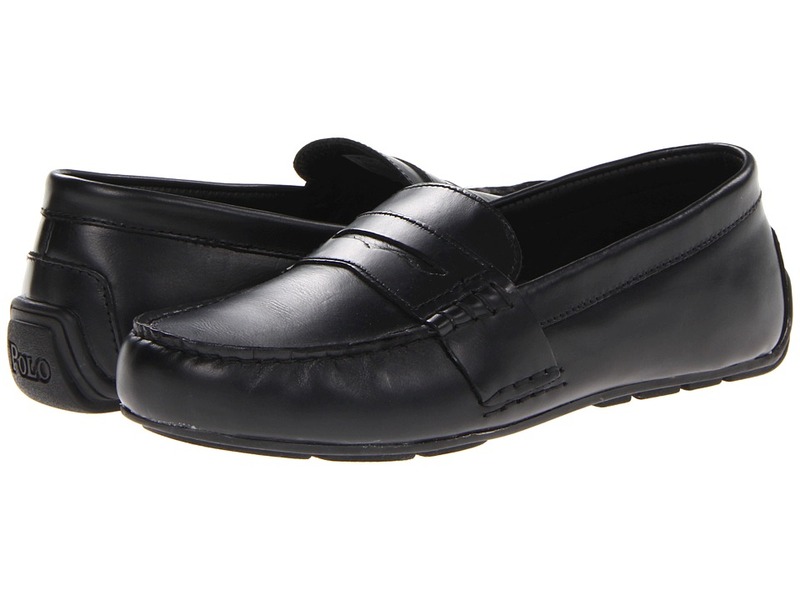 Easy slip-on style with an elasticized topline and pull tab at the heel. Fully lined. Lightly padded insole. Nubuck suede sole. Includes a signature Ralph Lauren&amp#8722embossed box. Imported. Measurements: Weight: 1 oz Product measurements were taken using size 3 Infant, width M. Please note that measurements may vary by size. Weight of footwear is based on a single item, not a pair. 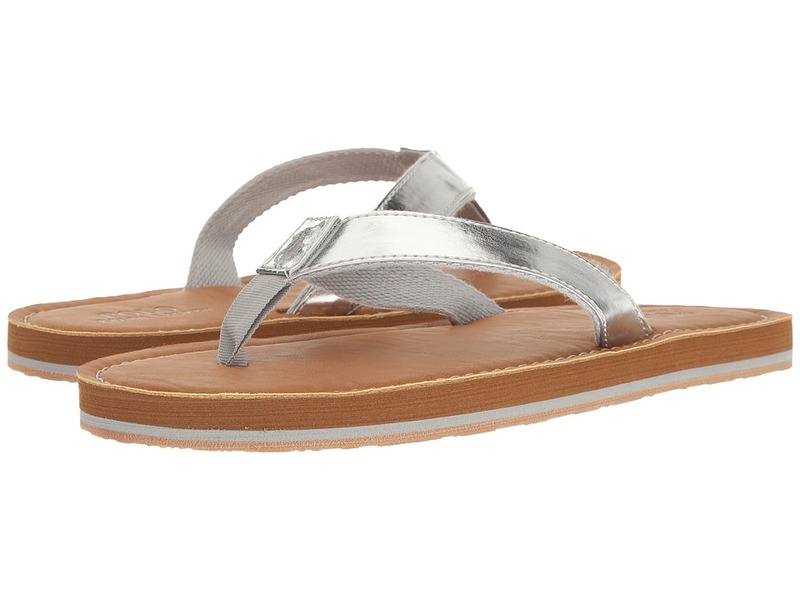 These fisherman sandals are the perfect addition to their summertime attire. 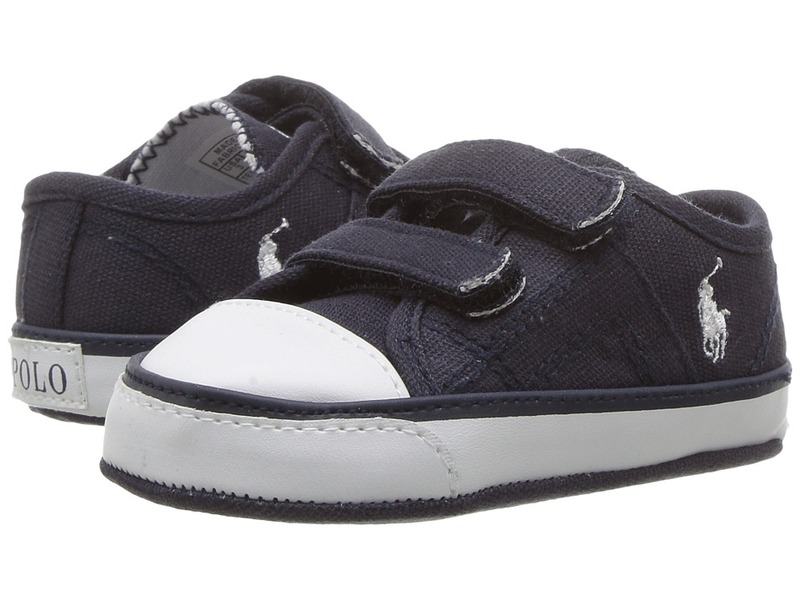 Fisherman sandals in a canvas upper with a classic pony logo decorating the side. Hook-and-loop closure for quick and easy on and off. Textile lining and a cushioned man-made footbed. Vulcanized rubber outsole with a branded logo at the heel. Durable rubber outsole. Imported. Measurements: Weight: 1 oz Product measurements were taken using size 3 Infant, width M. Please note that measurements may vary by size. Weight of footwear is based on a single item, not a pair. 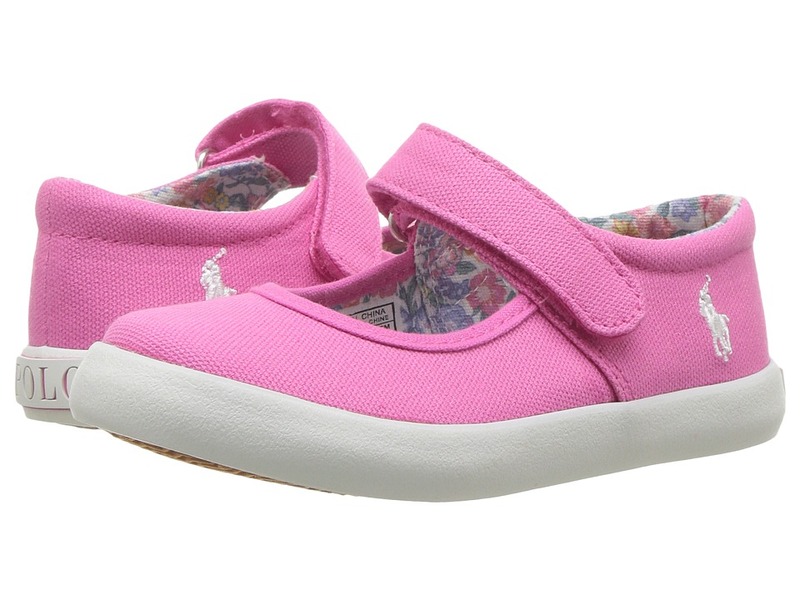 She skips onto the scene in dazzling cuteness in the Polo Ralph Lauren Kids Benton II slip-on sneaker! Easy slip-on design. Faux leather boasts a metallic finish. Side goring for easier entry. Signature embroidered pony at lateral heel. Polo block logo heel hit. Padded collar. Breathable fabric lining. Lightly cushioned textile footbed. Vulcanized construction. Man-made outsole. Imported. Measurements: Weight: 6 oz Product measurements were taken using size 2 Little Kid, width M. Please note that measurements may vary by size. Weight of footwear is based on a single item, not a pair. Watch her sparkle this season with the dreamy Pella mary jane. Faux-leather upper features scalloped details in a cute mary jane silhouette. Adjustable hook-and-loop strap. Padded collar for added comfort. Signature embroidered pony at the outer side. Padded cotton insole. Treaded rubber outsole. Measurements: Weight: 6 oz Product measurements were taken using size 13 Little Kid, width M. Please note that measurements may vary by size. Weight of footwear is based on a single item, not a pair. Watch her sparkle this season with the dreamy Pella mary jane. Faux-leather upper features scalloped details in a cute mary jane silhouette. Adjustable hook-and-loop strap. Padded collar for added comfort. Signature embroidered pony at the outer side. Padded cotton insole. Treaded rubber outsole. Measurements: Weight: 4 oz Product measurements were taken using size 8.5 Toddler, width M. Please note that measurements may vary by size. Weight of footwear is based on a single item, not a pair. 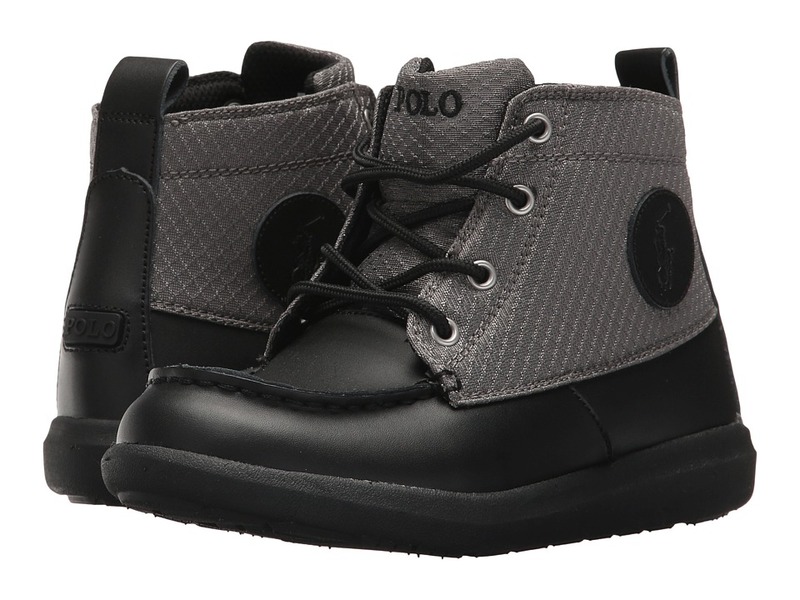 You~ll be cozy and cute all season long in the Polo Ralph Lauren Kids Siena bootie! Hook-and-loop strap closure. Uppers of soft suede. Faux-shearling lining for cozy comfort. Rounded toe. Debossed signature pony at the outer side. Treaded rubber outsole for durable wear. Imported. Measurements: Weight: 7 oz Shaft: 5 in Product measurements were taken using size 9 Toddler, width M. Please note that measurements may vary by size. Weight of footwear is based on a single item, not a pair. Get your little ranger in gear and set out on new adventures! Burnished leather upper with nylon. Lace-up closure for an adjustable fit. Textile lining. Lightly padded footbed for added comfort. Treaded rubber outsole. Imported. Measurements: Weight: 6 oz Product measurements were taken using size 2 Little Kid, width M. Please note that measurements may vary by size. Weight of footwear is based on a single item, not a pair. 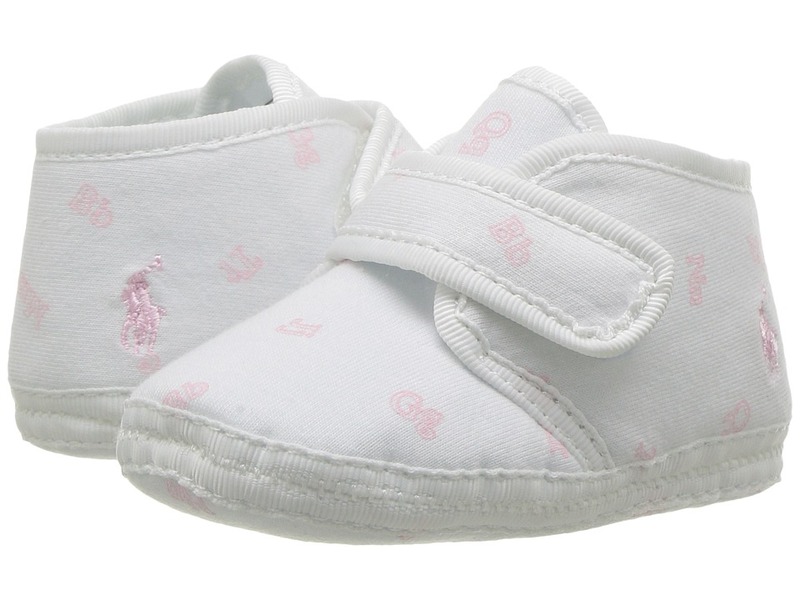 She~ll have sweet dreams when she~s wearing the super cozy Addison slipper from Polo Ralph Lauren Kids. Lightweight knit upper. Features a playful, pre-tied bow at vamp and satin trim. Easy slip-on style. Textile lining. Lightly padded insole. Durable synthetic outsole. Includes a signature Ralph Lauren&amp#8722embossed box. Imported. Measurements: Weight: 1 oz Product measurements were taken using size 3 Infant, width M. Please note that measurements may vary by size. Weight of footwear is based on a single item, not a pair. 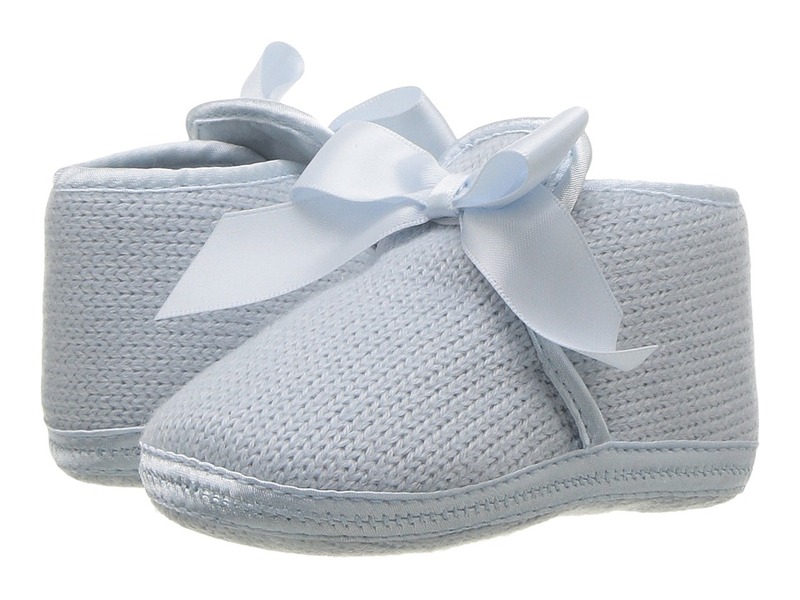 Your little one will have sweet dreams when they wear the super cozy Addison slipper from Polo Ralph Lauren Kids. Lightweight knit upper. Features a playful, pre-tied bow at vamp and satin trim. Easy slip-on style. Textile lining. Lightly padded insole. Durable synthetic outsole. Includes a signature Ralph Lauren&amp#8722embossed box. Imported. Measurements: Weight: 1 oz Product measurements were taken using size 3 Infant, width M. Please note that measurements may vary by size. Weight of footwear is based on a single item, not a pair.